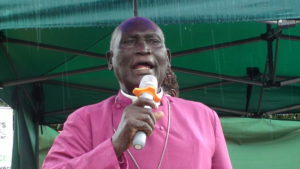 Bishop Nelson Onono Onweng, of Northern Uganda Diocese was among those present at the funeral of Saint Janani Luwum in 1977, as a one-month-old priest under his guidance. In 2015, the government declared February 16 a public holiday to celebrate the life of Saint Janani Luwum. Janani Jakaliya Luwum was the Archbishop of the Church of Uganda from 1974 to 1977 and one of the most influential leaders of the modern church in Africa. He was accused of treason, arrested and tried in a kangaroo court in February 1977 and was killed shortly after. Although the official account describes a car crash, it is generally accepted that he was murdered on the orders of then-President Idi Amin in Nakasero, Kampala following a period of great tension and ugly showdown with the regime. On Friday, thousands of believers from Uganda and beyond celebrated, his 41st Anniversary held at his ancestral home in Wi Gweng Village Mucwini Sub-county in Kitgum District. Bishop Nelson Onono Onweng, of Northern Uganda Diocese was among those present at the funeral of the saint in 1977, as a one-month-old priest under his guidance. He gave a testimony this week in memory of the saint saying the church should unite as they remember Luwum’s legacy. Bishop Onono told PML Daily that the life of servanthood and good leadership that the saint had should be emulated by the preachers of today. He blames preachers for delivering messages against each other in their congregations, deviating from the truth of the Gospel. Bishop Nelson Onono Onweng, of Northern Uganda Diocese was among those present at the funeral of the saint in 1977, as a one-month-old priest under his guidance. “I thought maybe the many churches were pulling out of Church of Uganda but I understand that the Catholics are also starting these churches. Sometimes you don’t understand why they start a church to preach about Onono Onweng, about Christ’s Church, about St Phillip. They call us the traditional churches,” Bishop Onono said. He noted that such churches are dead because the work of God is not limited by human understanding. The Bishop suggested that every home should have a pastor to prevent fights in churches. “If every home can have a pastor, I will be very happy particularly in Acholi here, where everybody will be saved without preaching against one another. We know that in the Church, there is no money, no salary, once you join, you know it,” he said. Bishop Onono castigated leaders who begin the church and go against others to win more followers for their personal benefits. Last week, a fight ensued between believers in the Catholics and Anglicans when a preacher allegedly burnt rosaries during a crusade organized by the Body of Christ church in Gulu. St Janani Luwum is celebrated for harmonizing Christians and standing for the truth to the point of death. After his assassination, his body was taken to the church yard at Wii-gweng, Mucwini, on February 19, 1977, where he was later buried. He is survived by his widow, Mary Luwum, seven children, four sisters, two brothers and several grandchildren. Elizabeth Akot, one of St Janani Luwum’s four sisters told PML Daily that her brother was the most peaceful and humble member of the family who cared for everyone and smiled easily with all. Archbishop Janani Luwum was the first sitting Archbishop in the entire Anglican Communion to be martyred in office, since the deaths of the Archbishops of Canterbury, Thomas Cranmer and William Laud, who were martyred in 1556 AD and 1645 AD respectively. 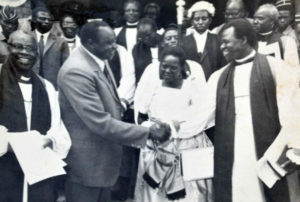 Archbishop Janani Luwum greets then president Idi Amin after church service.